ΧΙΧ St. Petersburg International Forestry Forum took place on 3-4 October 2017 in St. Petersburg, in which more than 600 specialists participated from many countries of the world: China, Russia, Italy, Finland, Japan and other countries. Vasilyev I.A. — Director, Stepchenko A.A. — Deputy Director, T.S. Koroleva — the Scientific Secretary, B.D. Romanyuk — Head of the Research Society of Forest Management and forest regulation, О.I. Vasilyev — Head of the Research Department of Economic Studies attended the event as SPbFRI representatives. The International Forestry Forum is organized with the support of the Government of the Russian Federation, the Ministry of Natural Resources and Ecology of the Russian Federation, the Ministry of Industry and Trade of the Russian Federation, the Federal Forestry Agency and the World Wildlife Fund (WWF). The forum discussed issues of international cooperation in the field of forestry, the development of the Forest Strategy until 2030, the introduction of intensive forestry in Russia, the issues of biotechnology and bioenergy, and the role of Russian producers in the field of forestry in the world market. Specialists from Europe, Asia and the Middle East shared their experience of forest management, and also considered the advantages of international cooperation in the forest industry. Partnership event of the Forum was conducted on October 2, 2017. International Paper Company in cooperation with SPbFRI and Leningrad Timber Industry Union conducted the on-site workshop "Planning and implementation of forest management measures for new forest management standards in operational and protective forests". 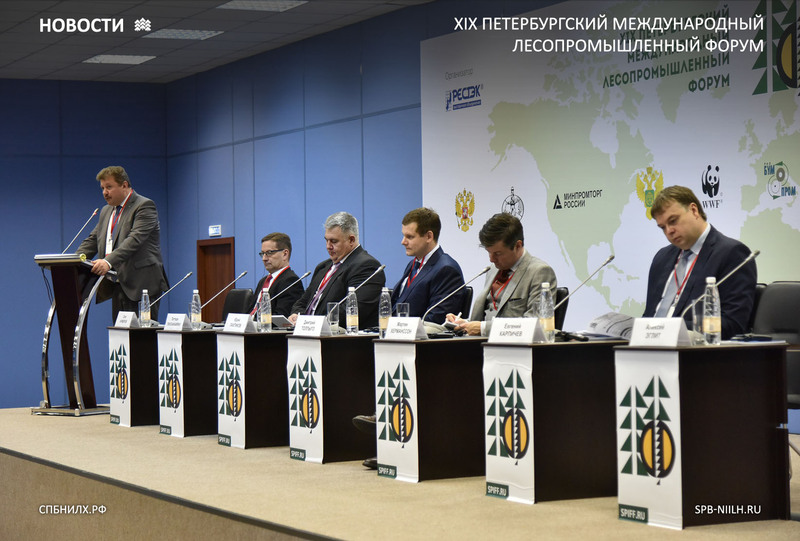 The event was organized as part of the conference "Intensive Forestry in Russia: today and tomorrow" within the framework of the main program of the St. Petersburg International Forestry Forum. Romanyuk B.D. became a moderator of the visiting seminar, using the demonstration sites of the Tikhvinsk Forestry Division of the Leningrad Region as example, he clarified the main principles and approaches in the framework of the Concept of Intensive Use and Reproduction of Forests, related to the planning and implementation of work on new rules for reafforestation, forest management and logging. At the Conference "Intensive forestry in Russia: today and Tomorrow", held in the framework of the Forum, Romanyuk B.D. made a report on the state of development and implementation of standards for intensive forestry.